Nice quality. Fabric is full and vibrant. Elevate the style of your window fixtures with this faux silk jacquard curtain panel from Exclusive Fabrics. The panel is detailed with a floral damask pattern embroidered with a pewter color over the black background. The panel is fully-lined to eliminate light from shining through and provide privacy. Beautiful product. Extremely well made. Definitely more of a bronze/brown color than pewter. White lining. Used black tassel tiebacks. The curtains are definitely very rich looking. The quality is superb. The length is true. I am not disappointed with the purchase. The shipping was prompt. These have nice elegant velveteen feel and look...you can see the pattern in the fabric when light shines through,however the lining prevents them being see-through.They fit perfectly in a room with black furnishings. I love these curtains! They are thick enough to be black out curtains. They look rich and elegant. Very nice, thick, and dark. Gorgeous pattern. Very very good quality, very thick and dark. It can be bright and sunny coming in the window and you can not tell with the curtains pulled. They are thicker than I expected so if you are going for that, great, if you are going for light and flowy, this is not the curtain for you. Arrived super fast. Within like 4 days. I loved the look and feel of these, but did not like how they hung when I used the rod pocket. I modified them (had to adjust the length due to my odd window) and added tabs to the back of the rod pocket. WOW! What a difference. They look very professional. Also, I seam ironed them to remove the fold marks which made a big difference. No problem with iron set for steam and just below cotton. I purchased these panels for my living room as a temporary window treatment until I come up with a final plan for that space. I was surprised by the weight, quality and the overall look for such a reasonably priced item. The curtains arrived quickly and were packaged nicely. The quality was very impressive and they look like a professional design center made them. What a difference they made in my living room. I love them more in person than on the website. Absolutely love the quality of this product. Would recommend this site to friends. Nice thick curtain, glams up my living room. beautiful; heavy and is a statement piece! Just perfect Very satisfied with quality and fabric. "How much does each panel weight? I want to make sure our curtain rod can handle it. Thanks!" These panels are approximately 6 lbs each in the smallest size and 7 lbs each in the largest size. "Do these take the rings with the "clips" attached or the standard ring? Or can you use either type?" You are able to attach rings with clips or with drapery hooks/pins. Either will work. Rods and pole works as well..
"Does it block out a lot of light? " This product does not have our specific blackout lining. It is lined & interlined with a standard cotton-poly lining which will help with darkening a space but not as much as an actual blackout panel. They definitely block out all light. "Here's a dumb question, but usually I've seen panels come as a pair. Is this the per panel price?" One order includes one panel. These are very high quality well for this price as close to custom as it get for off the rack. "Do you know when the 108" length will be available again? " 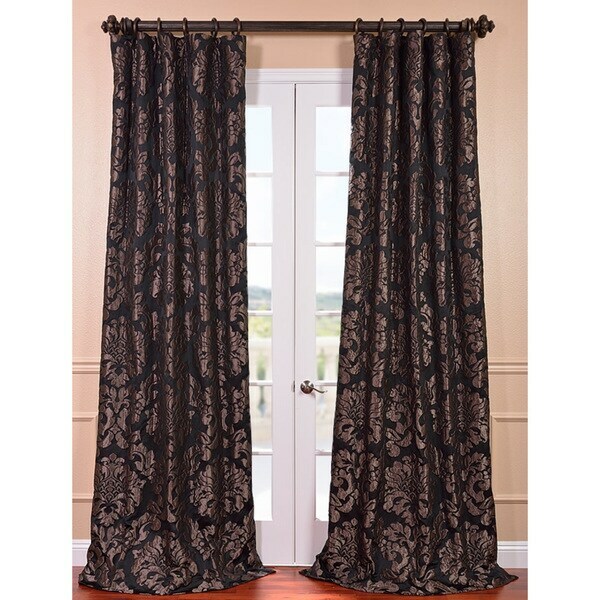 The EFF Astoria Black/ Pewter Faux Silk Jacquard Curtain Panel, will be restocked, when it becomes available. We cannot guarantee, that the curtain panel will become available. Please check back with us. It will look perfect in my billards room. trying to find curtains that will work in reading room. "The color description states "pewter". Pewter is a silvery-grey color. The pictures look very brass gold. Which is the more true color of the design on these curtains? Thank you, AK"
Hello akersting, the design color is brown. Have a great day!